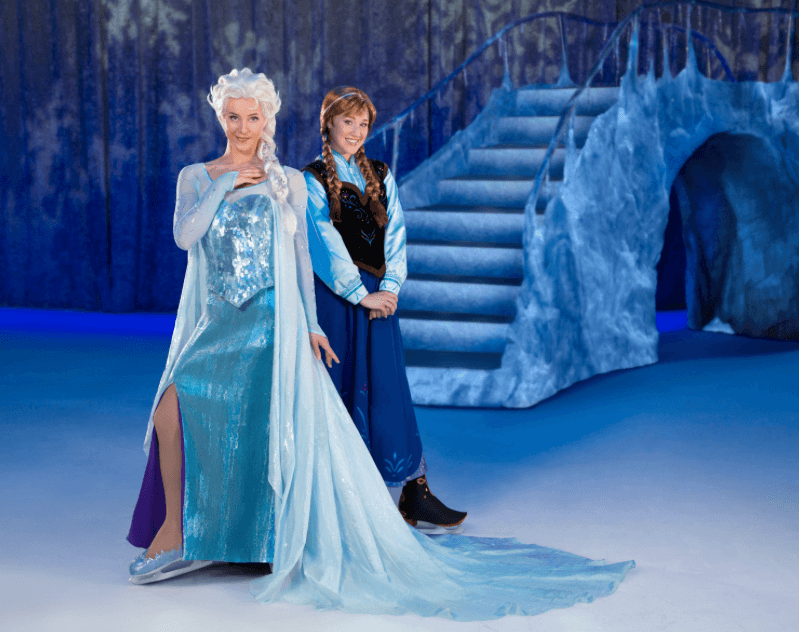 Disney on Ice has announced a new touring production based on the hit film “Frozen” to debut in September in Orlando, Florida. 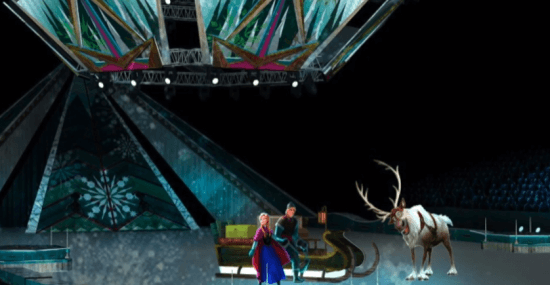 Featuring a cast of 39 performers, “Frozen” On Ice will follow the story of Anna, Elsa, Olaf, Kristoff, Sven, and the trolls across familiar landscapes from the animated movie. It will include a blizzard created by snow machines, a snowflake-shaped stage, and video projections to transport audiences to Arendelle, the North Mountain, and beyond. 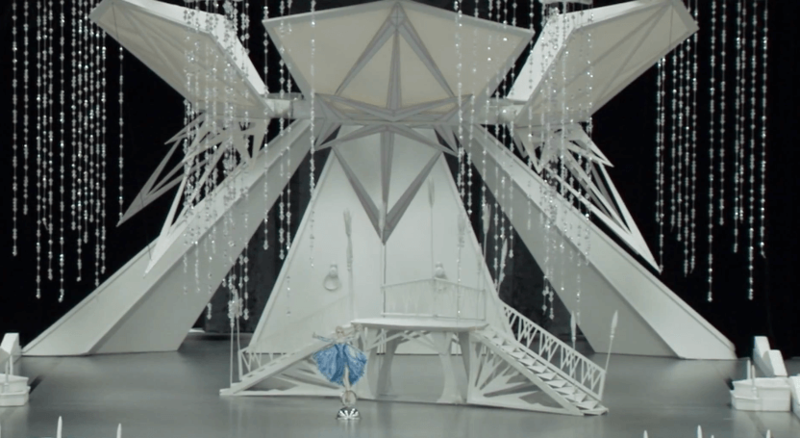 The show’s set design will encompass the space from the ice surface up through the air, art work and models of which are shown below. The costumes are inspired directly by those seen in the movie. Mickey Mouse and Minnie Mouse will also be part of the show, acting as hosts, also joined by Disney Princesses and characters from “Toy Story,” “Finding Nemo,” and “The Lion King.” The show is directed by Patty Vincent, developed with the aid of John Lasseter. 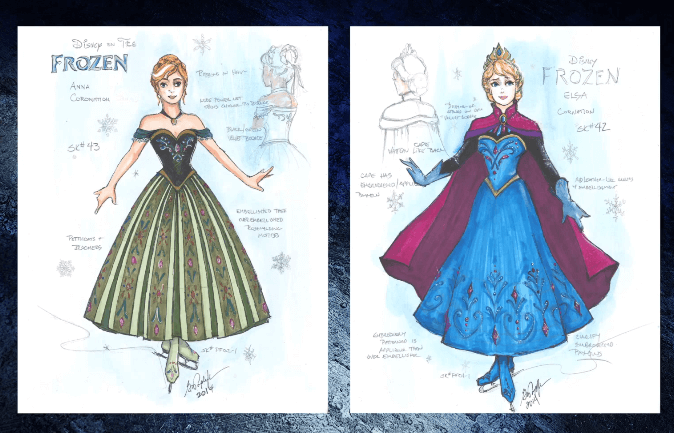 Rehearsals for “Frozen” On Ice will begin in July. 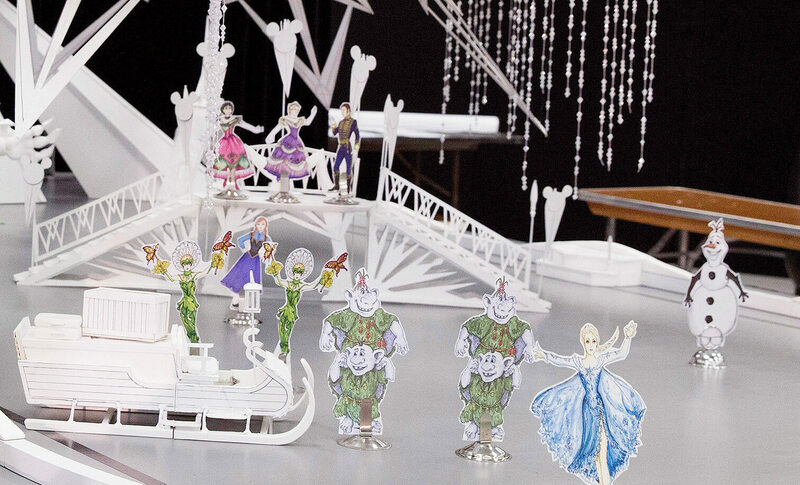 Tickets go on sale June 3 via DisneyOnIce.com, where a full list of cities and dates can be found. Presale tickets are already available using code TWEETS or SOCIAL at the link above. Please please please make a stop in Portland Oregon or somewhere close by! Yes Please make a stop in Portland Oregon!!!! Oh…my girls will be so excited! We usually have a Disney on Ice come. I hope it’s Frozen this year that comes to Chattanooga Tn. YES! Come to Portland!!!! Please! Yes, please come to Portland! I second that this would make my daughters day. It will be at the Baltimore Arena the Wednesday before Halloween until Sunday November the 2nd. The presale code for Baltimore is EARLY. Really hope the uk gets this!!! Yes come to west coast! PLEASE COME TO SALT LAKE CITY, UTAH! PLEASE DON’T FORGET THE WEST COAST! Pleeeaaassseeee!! Southern Cal needs this!! LA or SAN DIEGO! Come to Bossier City, La to the century link. .
Come to Grand Rapids MI!! Please come to Denver! That would be an awesome birthday present for my daughter who will be 3 on Christmas! Love you Disney! If you had jobs in colorado I would apply! Miami, Fl. Please! I’ve watched the movie about 60 times with my 1 year old. No west coast shows! Very sad, hope they plan to add some soon! 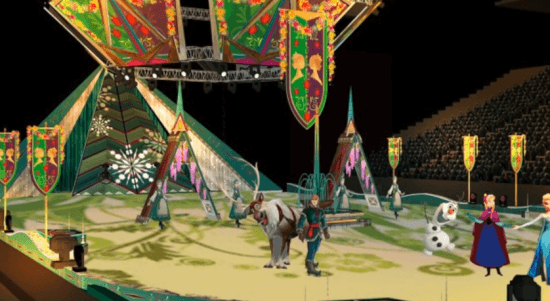 Unfortunately, a Disney on Ice show takes 2 years to go to the west coast. For example, whenever they premiere a new Disney on Ice Show in Florida , it isn’t in California until 2 years after. I’m hoping they have 2 touring companies though so they can do both coasts at a rapid pace because the Frozen train might die down by the time it gets to California if they wait that long. I got my tickets! New Jersey! Please come to Giant Center in Hershey or Mohegan sun in wilkes-barre Pa.but not in January or Feb. Weather too unpredictable!! Please come to anchorage Alaska! Would make this last year we are stationed here so much more fun for my 4 and 1 year old children! Please come to Johnson City TN or close by!!!!!!! The pre-sale code was given out on facebook this morning. Who is the costume designer? does anyone have a presale code for Philadelphia?? I hope Frozen on ice will be in Miami, Florida! Come to England, come to England, come to England!!!! Why are all the shows on the east coast? What about Oakland California? No West Coast/California dates at all?!? I was able look on Ticketmaster and it is coming to a lot of cities. I could view until next May. Any plans to come to Memphis, TN or Southaven, MS? I didn’t see those listed. It wont be coming to Europe for years then!! When the show came to PORTUGAL? COME TO MANCHESTER OR LONDON UK!!! West coast please!!! Fresno or Sacramento!!! Come to LA, west coast! Please come to Utah!! There are a LOT of kids that would love to see this here!! I noticed there are no dates scheduled for the West Coast. Are there any plans to add performances on the West Coast? We’re in Arizona, but willing to travel to California or Nevada to see a show. We sure will wait for the show to come to Montreal, Québec, Canada!!!! The Disney shows hardly ever come to Pittsburgh. I always see so any different ones, but only same one seems to come around. Please stay out of Des Moines Iowa… that is all. Please come to Charleston SC. My daughter and so many of her friends LOVE FROZEN.I loved it too. We just came back from Vacation from WDW.We had had just a wonderful time. The closest show for us is a 5 hour drive away in GA. Please come to Denver , Colorado ! Our Granddaughter would love to see everyone in person or on Ice ! She just had a Birthday she is now 5 and we had a Frozen Birthday Party ! Thank you if you can come out ! This is written by her Grandmother but she is telling me what to say ! Yes Please Come to Denver! Tis my daughters dream to see Disney On Ice, and She is so stuck on the movie Frozen, she even sang Do you want to build a snowman for her school talent show. I was shocked not to see Denver on the list. As I went yearly growing up as a child and would love to start her off on the Tradition with Frozen! PLEASE PLEASE PLEASE come to Denver, Colorado! My daughter would love to see Frozen on Ice! She watches the movie every minute she can and knows every word to the movie and every song! Please don’t leave Colorado out! Colorado is full of Disney on Ice fans!! Yes,please come to Denver or Loveland as I will travel from Kimball, NE with my children and friends. Please come to Denver!! 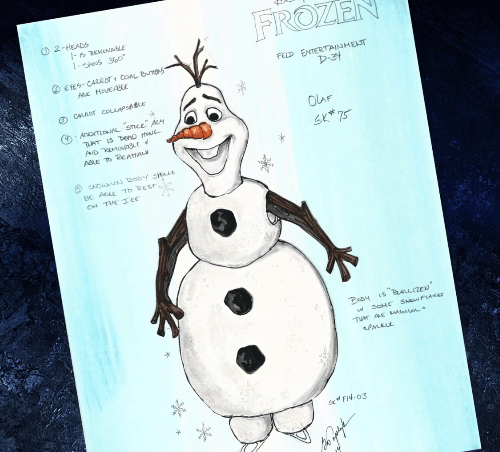 My son would love to see frozen on ice!!! COME TO DENVER! Why are you advertising in Denver when you’re not coming? So many little girls here, including my 5 year old, OBSESSED with frozen! One more for coming to Denver. We have gone to Disney on Ice for the last 4 years here. 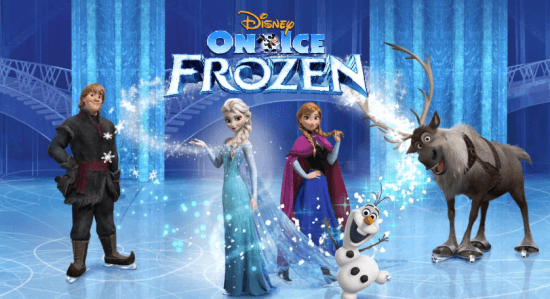 There have usually been 2 shows–one at Pepsi Center in early December and one at the Denver Coliseum in March or April–Please bring Frozen. Yes, another vote for coming to CO!!! Please. Ill be waiting here in San Diego Ca,,so Hurry!! Will they be coming to California? COME TO OTTAWA ONTARIO CANADA! Please come to Green Bay, WI. 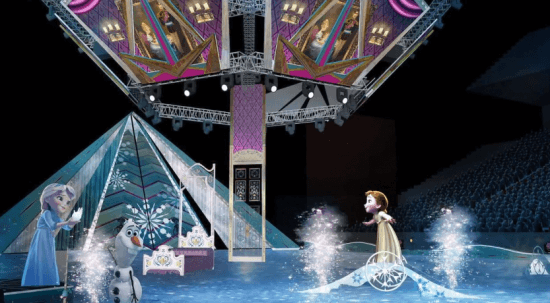 The Disney on ice shows have all been the same for the last several years and we would really like something new to see! Yes!! Please come to Green Bay, Wisconsin!! Green Bay, WI please! really want to go with grandkids! A vote from me to come to Green Bay, WI! Does anyone know if they are coming to Portland oregon? I heard that once a show comes out it takes 2 yrs before it hits the west coast. so u might not get the show for at least 2 yrs from what i heard on another site. They are coming next year in October, to Portland (Moda center). Does anybody know if they will add more dates to the schedule? I hope to see it in Miami, Florida! I am disappointed that the Frozen on Ice tour does not include the birthplace of Disney, California. My goddaughter has watched the movie…honestly I have lost count. She would love to see this production and we would so enjoy sharing the experience with her. Please make you way west. Can’t wait for it to come to Australia and I’m a 67 year old nan I love the movie. So excited! No dates scheduled in CALIFORNIA???? How sad!!!!! Hope they add more shows!!!! To everyone concerned about the show making it’s way to California or out westward, it’s worth noting that most tours have specific runs that focus on certain areas of the country at a given time. You’ll notice that the current Frozen tour dates include the East Coast, Southeast, Texas, and a handful of Midwestern cities. Rest assured, Frozen will have many more dates that cover much of the west coast, mountain, and other midwestern cities that are left out on this first run of the tour. These dates will likely start during the summer of 2015. You’ll notice that a lot of Broadway and other Arena tours conduct their schedules in similar ways where they concentrate in certain segments of the country. Second-ing the need to see some West Coast dates. Checking every day to see if you’re coming here to Arizona. I wouldn’t MIND travelling but we have a very nice capable venue that is already getting the Marvel show. Why not Frozen? Pittsburgh loves Anna and Elsa sooooo much too! 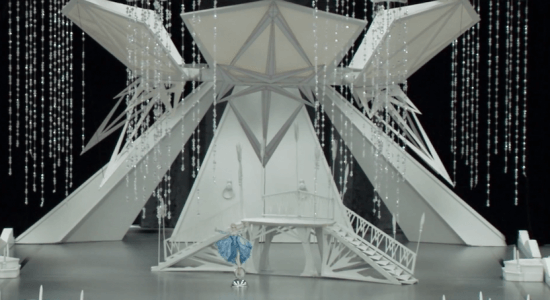 Please tour here…. Please come to Pittsburgh PA!! We are huge Frozen fans here in Pittsburgh and I was dissapointed not to see Pittsburgh on your list of cities. Are you going to be adding more cities soon? Thank you! Yes please come to Pittsburgh my son turns one tomorrow and Frozen is his absolute favorite movie when he hears it come on his eyes go directly toward the tv or computer. Please Please Please add Pittsburgh because we will definitely be at the show. Is Disney on Ice: Frozen coming to San Diego or Southern California? A friend got me tickets for one of the Boston shows because I fell in love with movie & music. Great seat and going to be a good time. When you come to Thailand? I wait Frozen on Ice, please quickly come to Thailand. Would love for it to come to arizona! My sister and our girls would love to see it! My youngest niece has all the characters knows all the songs and dances. It would make our day to see the girls so excited and happy to watch it on ice! Please COME TO DENVER COLORADO!!!! Why isn’t Frozen scheduled to come to Pittsburgh Pa? The console energy center is amazing. Isn’t our money just as good as people’s from Hershy or Philly? What a shame. We would like to see the show too. I was very surprised that you didn’t include Pittsburgh as one of the cities for Frozen. We would LOVE for you to come here! But for now I’m taking my daughter to Hershey to see the show! How about Northern California? San Francisco? They show commercials on TV, get the kids excited. Now I need to tell them to wait till summer 2015. That’s crap!! I agree. I saw the commercial and went on the web to see when it was coming to Los Angeles. Now I find out it won’t be here to summer 2015. My great-niece will be so disappointed when I tell her she has to wait. She LOVES Frozen. Wish they wouldn’t show the ads until the dates were set for here. When is disney frozen on ice coming to england? Please come to Denver! We would fill the house! Please come to Greenbay wi or appleton wi! My children are so in love with Frozen and would be extremely happy to see it on ice! I wanted to know why the show is only going to Atlanta and not Nashville, Chattanooga or Huntsville Alabama, my daughter and her friends love this movie and would have loved to see the show. Please tour in Pittsburgh PA.My 4 nieces just love frozen so much! 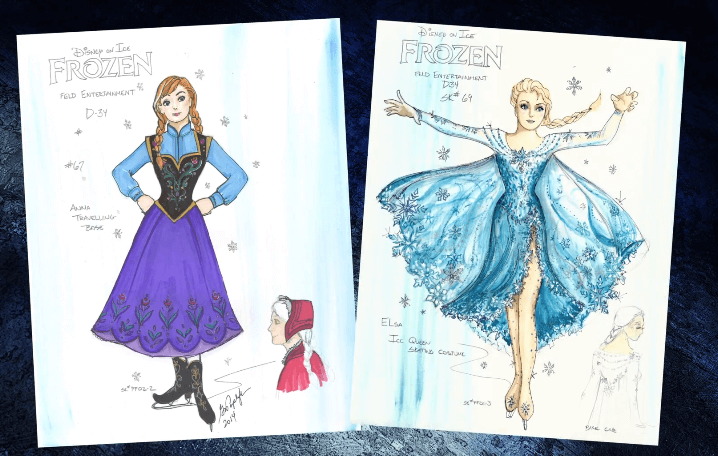 They would love to see frozen on ice. Yes, I agree with the comments. Please make a stop in Milwaukee, Appleton or Green Bay Wisconsin. So many times in Chicago, you would have a huge turn out even if only one show in Wisconsin. I wish Disney would for once release a show worldwide in one go, We want it in England please as well, otherwise it wouldn’t be fair. Why no Denver Colorado show dates? PLEASE come to Denver, Colorado! 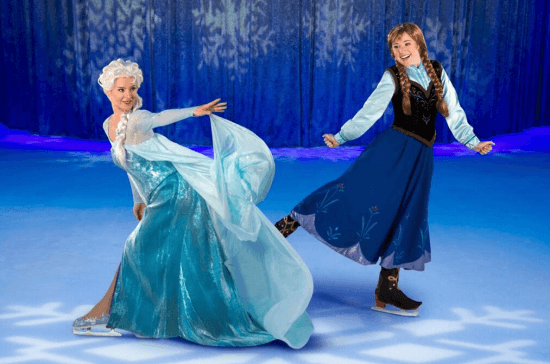 My twin girls and I have been going to Disney on Ice every year for the past 4 years for their birthday and they are so disappointed that Frozen does not have dates scheduled to come here. We would love it if you would add our city to the tour. My 3 year old and her 2 cousins and her friends would be so excited! COME TO DENVER, CO!!! Why are you not coming to WI!? You’re coming to MN and MI but not WI? WTF? Come to green bay! We are the FROZEN Tundra!!! Oh IL TOO! All the states around us but not WI!!! Please come to Denver. Every show would fill the house!!! I know a special little girl that’d have her dream come true if you came here!!! Please come to Denver!!! Why is there no Denver dates? Please Oakland ca. We’re dying to see it live OMG PLEASE! !!!! Why is there no show dates in the northeastern U.S.?